Malcolm Lipkin has been an important presence on the British musical scene since the 1950s, and happily, is still with us. He first became known for his orchestral music, later devoting much of his efforts to vocal and chamber music, but never neglecting works for full and chamber orchestra. He writes in a dissonant style but with such a sense of structure and developmental ability that his music is quite convincing even to those not inclined to dissonance. Each of Lipkin's three symphonies was written over a period of several years and, while not programmatic, each has an exterior influence. 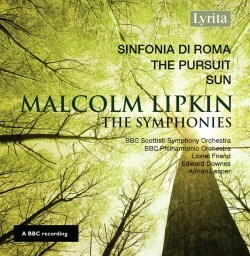 The Sinfonia di Roma arose from Lipkin’s being caught in a traffic jam in the Eternal City and contrasts the resulting din and confusion with the grace and grandeur of the monuments around him. Although written in the composer’s twenties the three continuous movements (Intrada [5:36] - Scherzo [5:54] - Notturno [7:47]) already evince his strong sense of structure and wonderfully precise scoring. Most impressive is the powerful central section of the scherzo movement which crystallizes the contrasting musical and extra-musical elements. The Notturno shows a quieter side of the work’s basic material but the clamour and violence of the traffic jam has the last word. Lipkin has long been interested in 17th century poetry and Marvell’s famous lines about “… time’s winged chariot” preface the score of the one-movement Symphony No.2 — hence its title ‘The Pursuit”. The symphony is based on several motifs heard at the beginning but it is Lipkin’s use of a frequently heard two-note secondary motif that most sticks in ones memory. The work is in two sections, the first exhibiting great forward motion and leading to a large climax. After a short interlude the second section provides a great sense of expanding horizons before leading to another climax. The two-note motif, like the “traffic jam” music in the Symphony No. 1, has the last word. Sun (Symphony No. 3) again takes its inspiration from 17th century poetry, this time a quatrain of Herrick describing the rising and setting of the sun. It is in an arch form and several short motifs heard at the opening provide the material for the entire work. The first section presents a feeling of great power and is beautifully scored. The central scherzo is more driven, almost as if the sun itself realized that it will soon set. The final section is quite solemn, increasing in eloquence, before a final, very austere, conclusion. All of these recordings derive from BBC broadcasts over the period 1983-1993. However the overall sound quality is good if not rich as the disc is part of Lyrita’s new Itter Broadcast collection. The Downes performance of the Symphony No. 2 is the most convincing, with a tight control of the orchestra and fine grasp of Lipkin’s orchestration. Friend’s rendition of the Sinfonia di Roma is also quite good, bringing out the contrasts inherent in the music. Leaper’s performance is less impressive, although he does maintain the structural consistency of the work. The notes by Paul Conway are excellent. Lipkin has been poorly served on disc; at present only one work is available (see link) although at one time Hyperion had a fine LP (A66164) of his chamber music (Clifford's Tower, String Trio, Pastorale) which seems not to have been issued as a CD. Consequently, these performances are of great importance as examples of British symphonism in the second half of the twentieth century.